R3 can simulate and copy any IC and ID cards , like access control cards of House door or Building door, Elevator card, Parking card, Time card, Payment card, Supermarket card, transportation card. R3 has Build-in Germanium, Volcanic Magnet and FIR Energy Stone in this ring , it can improve human performance effectively. R3 carries a new NXP smart NFC chip, it brings top speed operation experience to the following Android mobile NFC features, like "Private Note","Mobile phone lock","Quick start","Share information". R3 No need battery charging and IP68 Waterproof. 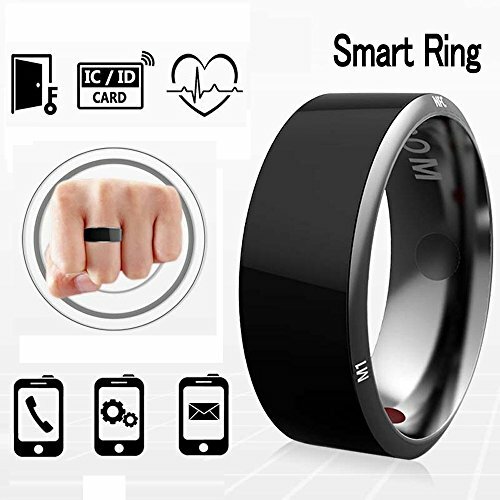 The smart ring is a Wearable electronic components, it can connect IC / ID / NFC Card Reader like doorlock or cellphone to Unlock, Pay, Share information or Operate some mobile function ; Original Health Module can improve human performance effectively. The product shape is designed according to the international popular elements, created by the pure medical titanium, no need to charge, high waterproof, and suitable for any people at any time. Health module: Remove infrared ray and adjust body function by the FIR Energy Stone and the volcano magnet. Lock and unlock your Smart phone or tablet quickly, hide the app when you leave your smart phone alone. Control Applications: you can write a fixed process list ahead of the time, and the ring will start the applications each time by simply touch. You can use the R3 as ID and IC cards. Because R3 can copy ID and IC card messages. If you have any questions about this product by Efanr, contact us by completing and submitting the form below. If you are looking for a specif part number, please include it with your message.